New project day 2 Finished! 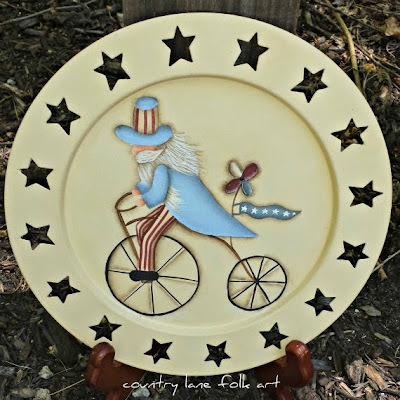 So I finally had some time to finish the plate I posted the other day using DecoArt chalky paint. 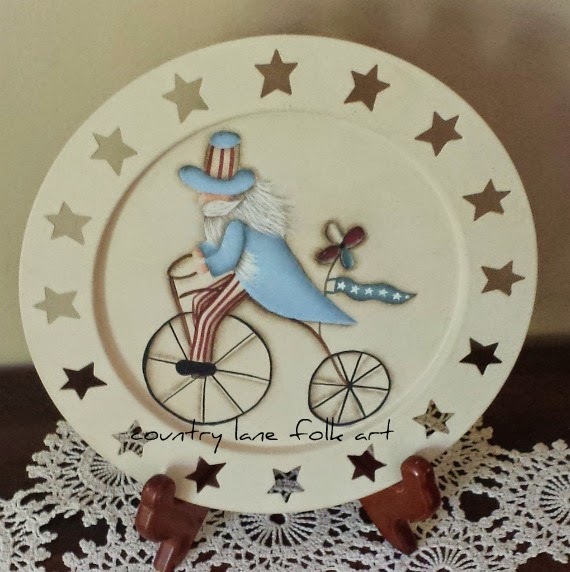 I decided to paint this John Sliney Uncle Sam design on it. 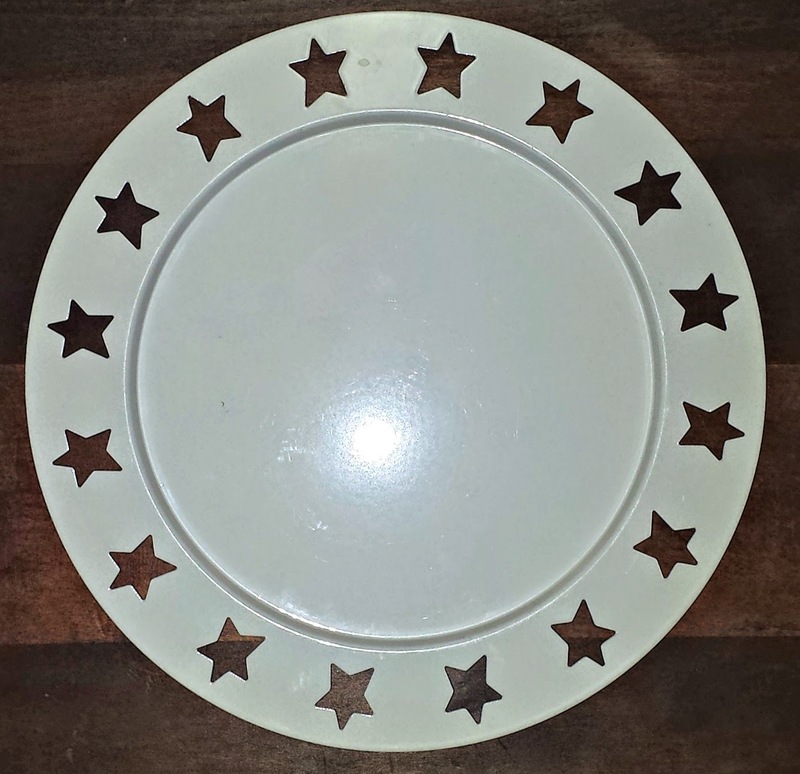 I thought the design worked well with the star cut outs on the rim of the plate. I will be adding this to my Etsy shop for an upcoming team celebration! THe folk art and prims Etsy team that I am a member of, will be having a summer celebration soon. 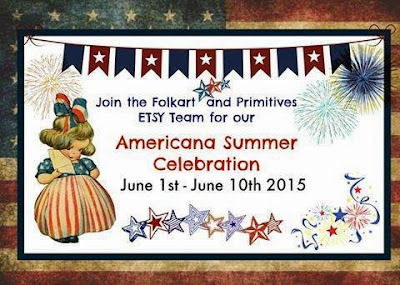 I'll have some new items in my Etsy shop for the celebration! Hi everyone! Taking a break from working on epatterns for today. 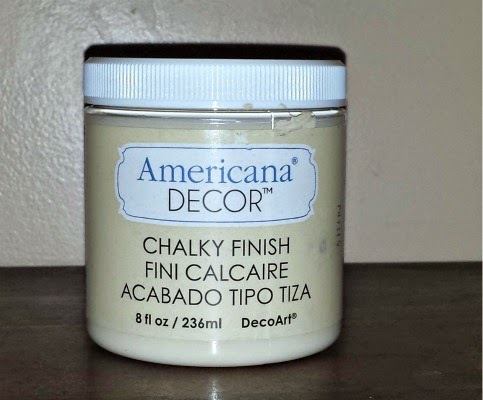 I've had some chalky paint for a while now that I've been wanting to try. This color is called Timeless. If you're a painter, this color reminds me of DecoArt's Antique White. I really like it. 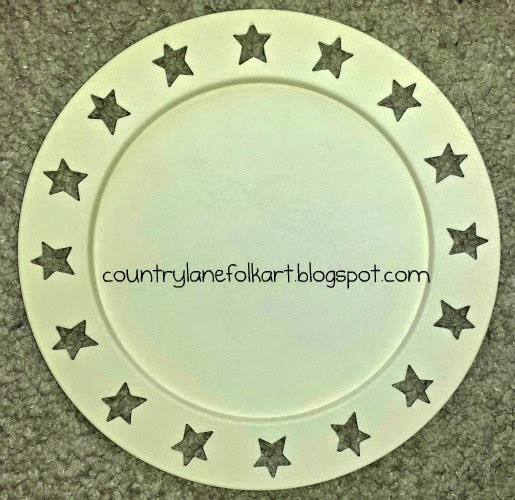 I've had this metal candle plate in my stash for a very long time and it was time to do something with it. 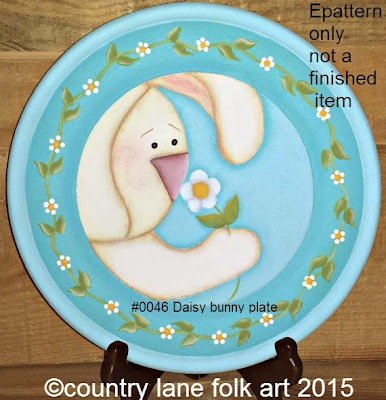 I have a John Sliney design in mind that I will paint on it. 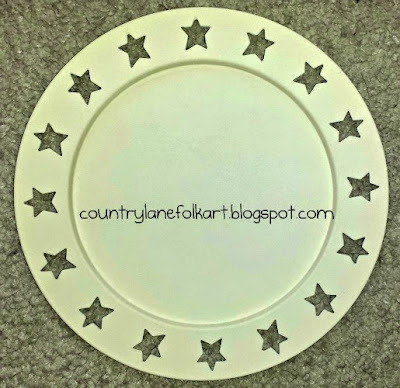 Here I have base coated the plate with the chalky paint. The best thing about this chalky paint is, there is no prep work before hand. If using regular acrylic paints, you would need to prime the metal before painting, but with the chalky paint, you just start painting. The coverage is excellent. I like to sponge my base coats onto metal, to avoid brush marks. Now it's time to transfer the design and start painting! 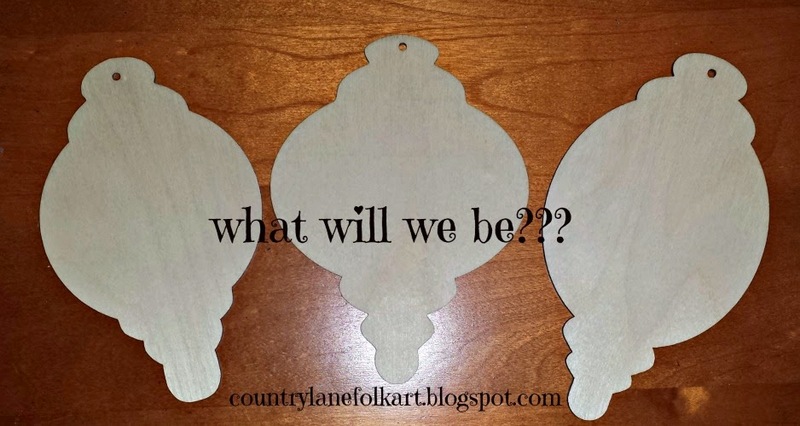 Stay tuned for the next step! Hi all, I've just added 2 new epatterns to the blog. 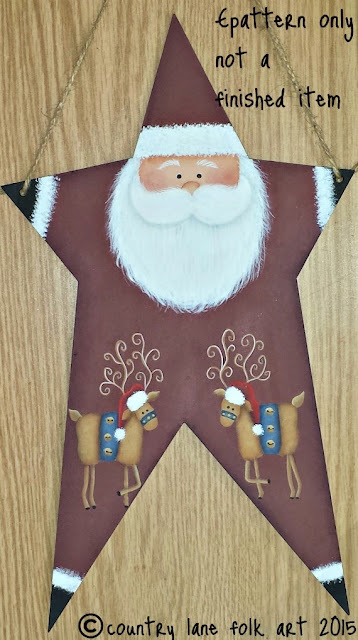 First up is #0048 Star Santa wall hanging. You can find him listed under the Santa category at the top of the page. 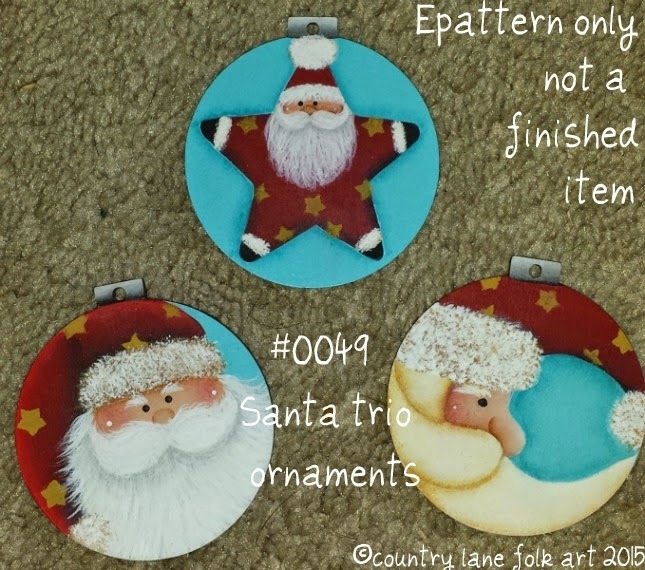 And #0049 Santa Trio ornaments. 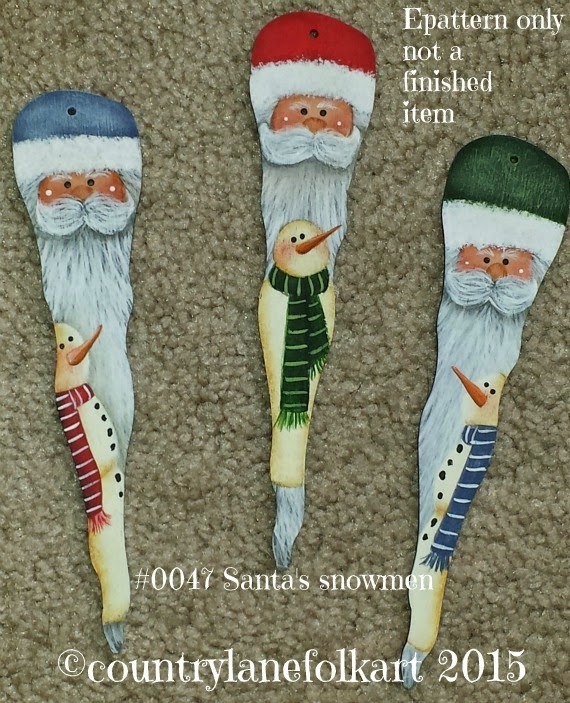 I had fun painting these Santa's. I decided to use a bright turquoise for their background colors. I think it makes the red pop. You can find them listed under the ornament category. 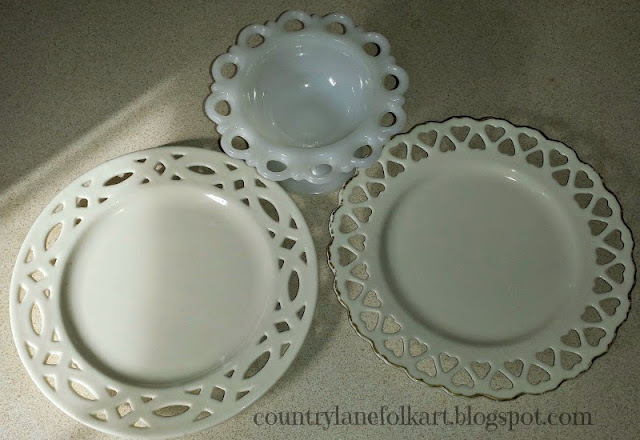 Both surfaces are available through cupboard distrubiting and the paint I use is DecoArt Americana. 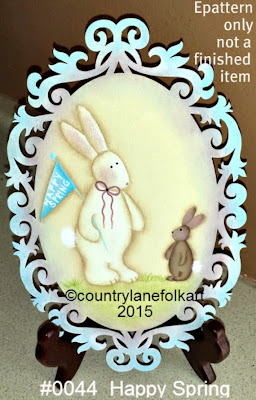 Just a quick note to let you know, I've added a new epattern to the blog. 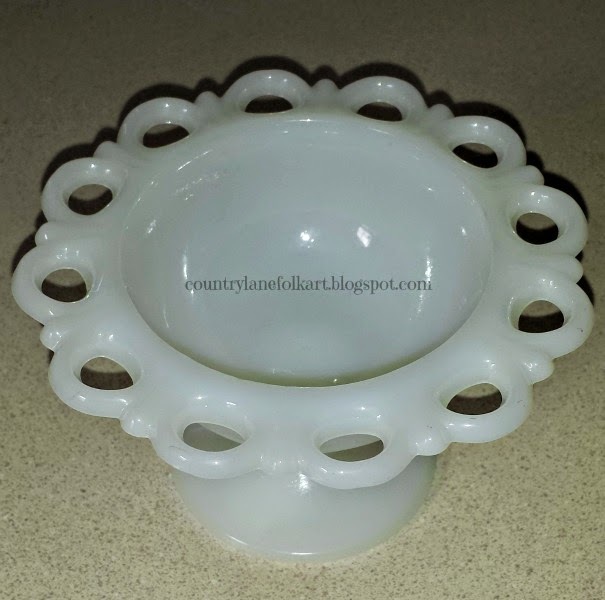 You can find it listed at the top of this page under Ornament epatterns. The surface is available through cupboard distrubiting and the paint I use is DecoArt Americana. Just a quick post to let you know I've added some new bunny themed epatterns to the blog. 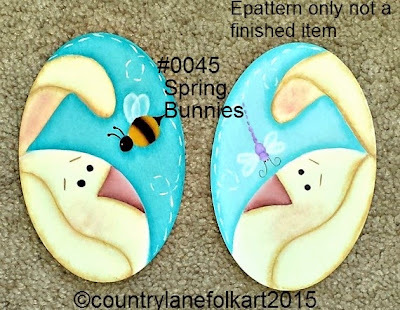 You can find them listed under SPRING EPATTERNS at the top of the blog page. I had the opportunity to go to a different Goodwill than I usually go to. This one is about 40-45 minutes from my house, so I don't get to it often. But when I do, I usually find something good! I found these 2 plates, about the size of a dessert plate. I was immediately drawn to the cut out detail work around the rims. Look at the little hearts on the one plate. Isn't it cute? I'm not worried about the gold paint that has chipped off the rim in spots, I plan to paint the entire plate so that won't show anyhow. The other rim design is a perfect match for a prim style painting. I also found this little dish that I think might be milk glass? Not sure about that so if anyone knows, please let me know. I thought it was so cute with the little cut out rim and for only $1, I couldn't leave it behind. I won't be painting this. 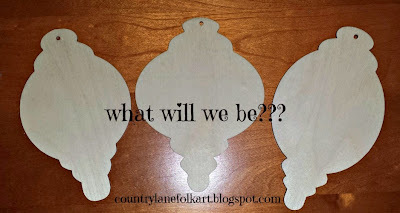 Hello out there in blog land! I hope everyone is having a nice weekend! The blizzard that was supposed to hit us, seems to be a flop. Don't get me wrong, we still have some new snow out there, but nothing like the 24 inches they were predicting! The wind is really whipping the snow around out there, but the sun is out! Yesterday I went to the goodwill, I try not to go on the weekends because it's always a mad house. Well, it was no different. They were having a first time ever, 50% off your purchase sale! I found a few things that I could paint on, but lately, there hasn't been anything that great to get exceited about. 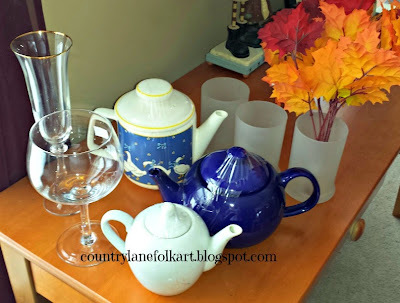 I found a few teapots, some frosted candle holders, some wine glasses for painting. Look at that ugly goose teapot! Straight from the 80's when country geese were all the rage! I liked the shape of the tea pot, and those geese will be painted over for sure! The goodwill I go to is a brand new one, but I find the prices are really high. It's disappointing, especially when there is a dollar tree right across the street from this goodwill and you see something from the dollar tree, for sale at goodwill for $5! That's crazy! I don't go to this one that often, for that reason. These ornaments are on my painting desk right now. If I like the way they come out, they will be a new epattern! I have 2 done, 1 more to do!